Stepping Stones has been serving the humanity since 2001. Besides UAE their good work can be seen in California – San Mateo, San Jose and Woodland Hills & Pasadena. Children who suffer from Autistic Spectrum Disorders are given special importance by providing medical treatment and arranging leisure activities for them. Development based training programs are scheduled at Stepping Stones so that children’s behavior is analyzed and seen; if they need any medical assistance. Complete medical support is provided to those children who are suffering from Autistic Spectrum Disorders. Recreational activities are scheduled in order to make Stepping Stones a fun place for children. Nasr Leisureland bus stop is 290 meters away from Stepping Stones Center, a minute walk is required to cover the extent of space between the two locations. Take route number 42 from the Airport Terminal 1 bus station. 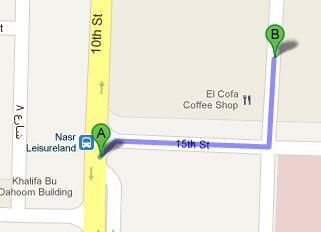 This route will drop you at the Nasr Leisureland stop, from their head in the northeast direction, toward the 15th St. After covering around 26 meters take slight turn onto 15th St and then the first left turn will help you in locating Stepping Stones Center. For a detail viw of the pedestrian path Click Here!